Flip Master is a trampoline mobile video game that involves you playing as a character named “The Dude”. The game that is available for both iOS and Android devices was developed by Miniclip.com, the well-known mobile games developer. It was released on August 8th, 2017. The latest flipping game from the company features super realistic graphics, physics, and accidents. As opposed to the previous flipping game from the sequel called Flip Diving, the trampoline aspect of this game looks more realistic. It allows you to train and become a trampoline master. This is possible due to the features such as bounces, gym, frontflips, gainers, backflips etc. The gameplay of Flip Master mobile game is quite addictive and amazing. You set your own records and keep breaking them by ensuring that The Dude is always jumping on the trampoline. This way you make your scores to be higher, thereby setting new records. As you play on, take care not to let your character land on his shoulders or head while undertaking jumps. If this happens, The Dude will break down and this lowers your score as well. Therefore, ensure that he only lands on his back, feet or stomach. This is the only way to keep him safe and allows you to continuously attain higher scores. Other than the main character, there are lots of other characters which are also as interesting. You are at liberty to pick whatever character you prefer to play with. To be able to even get higher scores, you can unlock stunts and flips which are more advanced and that you can perform on the trampoline. These instantly give you higher scores. There are gaming currencies such as gold and coins which are available to be collected. These are helpful for getting certain game items. To collect the coins, you jump your character on the trampoline and touching them as they rain around him. By tapping and moving a finger to the right or left of the screen, he’ll move as you need while collecting the coins. The gold and coins are essential for getting game power-ups. However, gold can only be obtained by real-life money as it is a premium currency. You are at liberty to pick your preferred location which can be a gym, backyard, competitive trampoline, trampoline park or crazy circus. You can unlock spectacular and dangerous skills such as frontflips, backflips, and gainers among many more. You can choose from a variety of power-ups such as foam cube, medicine ball or coin rain, etc. You can pick a character of your choice, customize and upgrade him to have special abilities. This feature allows you to record your best moves and show them to others. 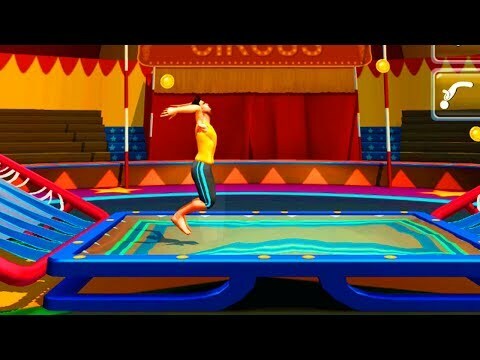 Flip Master has proven to be a nice trampoline game that offers a great gameplay to users. It’s a great way to spend leisure time.